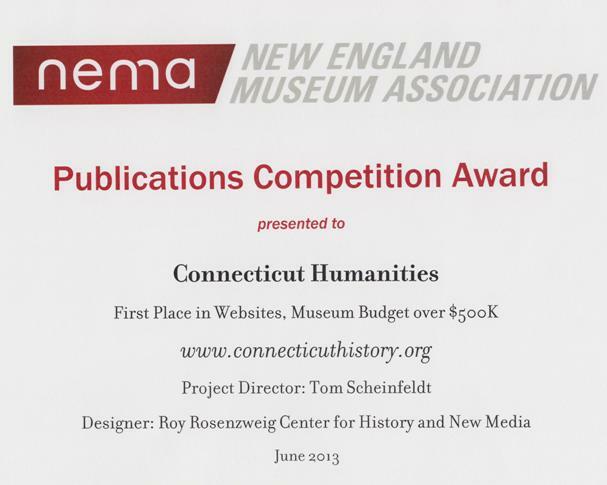 The New England Museum Association (NEMA) has awarded ConnecticutHistory.org top honors for excellence in design, production, and effective communication in web publishing for 2013. The full list of 2013 Publication Award winners can be found at the NEMA website. Congratulations to our fellow award recipients and, particularly, to those in Connecticut: Mystic Seaport, Guilford Keeping Society, Mystic Arts Center, Yale University Art Gallery, and Historic New England (Roseland Cottage). Receipt of the First Place Award for Websites (organizational budget over $500,000) marks the end of a successful inaugural year for ConnecticutHistory.org. A project of Connecticut Humanities in collaboration with the Roy Rosenzweig Center for History and New Media, ConnecticutHistory.org went live to the public just over a year ago on June 4, 2012. Major funding from the National Endowment for the Humanities and the State of Connecticut made realization of the project possible. An innovative re-imagining of the traditional state encyclopedia, ConnecticutHistory.org has published over 615 entries, created 245 resource pages, and gathered a steadily growing following of readers like you. It stands today as a trusted resource for interpretive content on state history. But, we don’t do it alone. Thanks also goes to our content Content Partners, Connecticut Explored and Connecticut History Online, as well as to the state’s museums, libraries, archives, historical societies, and universities. These organizations have become our chief collaborators in bringing high-quality historical content—based on their collections and research—to the public. A number of new ideas, collaborations, and developments are in the works. Together with more stories, more resources, and more news of history from around the state, our second year looks to be even better than the first. Books from CT Humanities – For a Buck!